← “Foragers Broadcast” Episode 28 – Check it out! 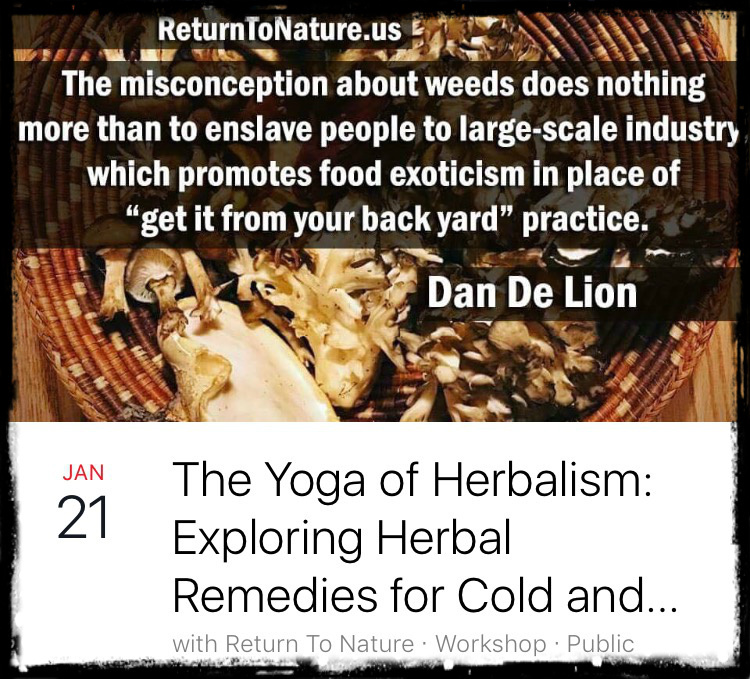 Price: $30 – Join Dan for a discussion on Ayurvedic herbal principles and herbal approaches to apply for the cold and flu season for the whole family. In this class, each student will become empowered to explore the many, many applications and preparations for working with making and administering remedies for the whole family. Demystify aspects of the ancient lineage of herbal medicine and bring your questions! About: Dan De Lion is an earth herbalist, forager, musician, and teacher. He teaches through Return to Nature, providing classes, lectures, and seminars on wild food foraging, mushroom identification, herbal medicine making, as well as primitive and survival skills with a focus on wild foods and forest medicines. Check out more at www.returntonature.us.